Nothing other than the usual My Week in Manga feature was posted last week at Experiments in Manga. However, I still have a few things in store before the year is through. Later this week you’ll want to be on the lookout for the monthly manga giveaway for December. I’ve also been hard at work on my list of notable manga, comics, and other books that I’ve read that were released in 2016. That list should be ready to post in the very near future as well! 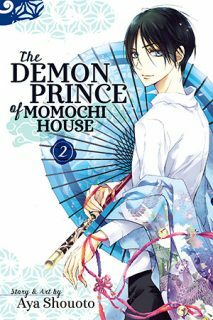 The Demon Prince of Momochi House, Volumes 2-6 by Aya Shouoto. It was the beautiful artwork and yokai that first drew The Demon Prince of Momochi House to my attention and that continues to be a large part of the series’ appeal for me. I’m also enjoying the story’s melancholic atmosphere as the manga explores themes of loneliness and the desire to belong. Himari, who is an incredibly sweet and caring person, is steadily building her relationships and friendships with the locals, ayakashi and humans alike. However, more the romantic elements of the series are admittedly less convincing. Although there is an underlying story about the mysteries surrounding Aoi and Himari’s efforts to free him from his tragic fate, The Demon Prince of Momochi House frequently almost seems episodic in nature as Himari is introduced to a variety of supernatural wonders and dangers. The seemingly directionless and less-than-cohesive storytelling can be frustrating and sometimes even feels a little shallow, but overall I find the series to be alluring and provocative and look forward to reading more. 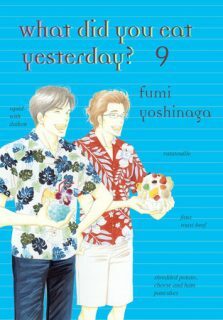 What Did You Eat Yesterday?, Volumes 9-11 by Fumi Yoshinaga. I am incredibly happy that What Did You Eat Yesterday? is being released in English, so it makes me sad that the series doesn’t seem to be doing especially well in translation. It’s a shame, because it really is a wonderful manga. While I certainly appreciate the food aspects of What Did You Eat Yesterday?, I particularly love the realistic and nuanced characterizations found in the series. The food is all well and good, not to mention beautifully illustrated, but it’s the characters and their relationships that really make the series work. Shiro’s character development has probably been the most interesting and satisfying. I’m very glad to see his relationship with his parents improving even after some significant setbacks. While he’s still not out in his professional life, it is clear that he is becoming more comfortable publicly expressing his sexuality. Fortunately, Shiro and his long-term boyfriend Kenji have the love, support, and acceptance of others which makes that easier. More recently, rather than their homosexuality, what they’ve had to worry about are Shiro’s aging parents and the rising cost of living. 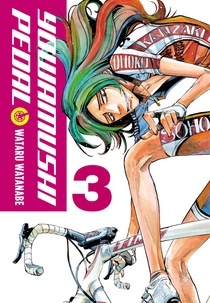 Yowamushi Pedal, Omnibuses 3-4 (equivalent to Volumes 5-8) by Wataru Watanabe. Out of the recent spate of new sports manga being released in North America, Yowamushi Pedal is currently one of my favorites. I have seen a fair amount of the anime adaptation so at this point I am very familiar with where the plot is heading, but even so I still find the original manga to be immensely engaging. Before Yowamushi Pedal, I actually didn’t realize how much of a team effort cycling could be; it’s interesting to learn about the various strategies that can be used to win a race. These couple of omnibuses largely focus on Sohoku’s intensive training camp and also introduce some of the major competition. The characters are fun, some of them are frankly pretty cool, too, and they all have distinctive personalities. The Sohoku team especially is made up of a group of quirky but likeable and talented young cyclists. Art-wise Yowamushi Pedal could almost be described as ugly, but I really like its highly dramatic and energetic style. Watanabe probably uses more speedlines than any other artist I’ve seen, but the effect is great. Legend of the Galactic Heroes, Volumes 2-3 by Yoshiki Tanaka. Despite the nearly constant war and political upheaval present in the Legend of the Galactic Heroes novels, the series isn’t really that action-oriented. I suspect some people will actually find it to be rather dry and perhaps even textbook-like. With only the occasional bout of melodrama, the series quickly moves from one event or venue to the next and the cast of characters only continues to grow. (Granted, as this is war, not all of them survive very long after being introduced.) Because the scope is so sprawling sometimes it feels as though Legend of the Galactic Heroes lacks depth of story and characters, instead opting for a wider view and summary of major events. However, Tanaka does show how the complexities of societal, political, economic, and militaristic influences can impact one another. The books frequently read like a popular history, and the series actually reminds me a bit of Romance of the Three Kingdoms, too. So far I’m really enjoying the series and find its story and characters interesting. I like the focus on tactics and strategy as well as the influence that real-life history has had on the series. Okay. So I don’t usually get very personal here at Experiments in Manga, but I feel it’s needed this time. Last week I had every intention of posting an in-depth review of Dawn, the first novel in Yoshino Tanaka’s renowned space opera Legend of the Galactic Heroes. But Thursday came along and I’d only managed to write a quarter of it and I finally had to admit to myself that it just wasn’t going to happen. And so while driving to and from taiko rehearsal that evening I took the opportunity to reevaluate some things and to try to find a sustainable solution for Experiments in Manga. The last year and a half or so has been rough on me. Without going into unnecessary details, I have been under tremendous amount of stress at work, at home, and just in general with more and more responsibilities to take on and less and less time for myself. While my anxiety issues are fortunately mostly in check at the moment, being stressed out feeds directly into my depression which in turn feeds into being stressed out. It’s a miserable cycle that’s difficult to break. And it makes doing all of the things that I want to do nigh impossible, even if I actually had the time to do all of those things (which I don’t). I can’t do much about the situation at work right now, and my options outside of work are limited, too, but one thing that I have complete control over is my blogging. While there are some very strong arguments to be made for me to completely give up writing at Experiments in Manga, that’s not really something that I’m prepared to do yet. However, I will be drastically changing my approach and will be writing less, at least for the time being. I’m hoping this won’t be permanent, but I will have to see how things go as I try to find some balance in my life. And so: For now the My Week in Manga feature will continue to be posted as normal, as will the monthly manga giveaways. The Bookshelf Overload feature will still make an appearance every month, too. However, in-depth reviews and other long-form features will by necessity be posted more sporadically and won’t necessarily adhere to a specific schedule. To make up for this somewhat, the Quick Takes section of My Week in Manga will be expanded slightly to include my thoughts on novels and nonfiction works among other things. Even though overall I will be writing less, this means that I’ll be able to read more, and hopefully relax more, which will be very good for me. Anyway! In happier news, according to the series’ translator, the second volume of Quantum Devil Saga: Avatar Tuner is scheduled for release later this year. (I reviewed the first volume when it was released and liked it so well that it made my list of notable works of 2014.) Kodansha Comics’ most recent creator spotlight features an interview with Akiko Higashimura. The latest manga Kickstarter campaign to launch is a project by Fakku and Toshio Maeda to release a remastered edition of Urotsukidoji: Legend of the Overfiend. Some pretty big news for fans of BL in translation, Japanese publisher Libre has cut its ties with Digital Manga. Sadly, though perhaps not especially surprising at this point, Digital Manga’s press release comes across as very passive aggressive and unprofessional. Persona Q: Shadow of the Labyrinth, Side: P3, Volume 2 by So Tobita. I haven’t actually played the Persona Q video game, but from what I hear from others, the manga adaptation remains true to its tone and main storyline. My knowledge of the original Persona Q, as well as my knowledge of Persona 3 and Persona 4 which directly tie into Persona Q, is admittedly cursory. Those who do not have at least some familiarity with the Persona franchise will be at a significant disadvantage when reading Persona Q, especially when it comes to understanding the characters and their personalities. Fortunately, I know enough to be able to appreciate the Persona Q for what it is—a fun and slightly silly adventure with puzzles, labyrinths, and cute artwork (much like the game itself, which I suspect I would greatly enjoy playing). The manga is very clearly an adaptation of an role-playing game as some of the side quests, boss fights, and other elements of gameplay remain quite evident, but the ways in which they are incorporated into the story are generally unobtrusive and make sense within the context of all that is going on. Red Red Rock and Other Stories, 1967-1970 by Seiichi Hayashi. As far as creators of alternative manga go, Hayashi is fairly well represented in English with several volumes of manga available in translation. The most recent is Red Red Rock and Other Stories, a collection of thirteen of Hayashi’s short avant-garde manga as well as an accompanying essay by the volume’s editor and manga historian Ryan Holmberg. Most of the stories come from the influential alternative manga magazine Garo, but two of the selections were actually created for the magazine A Woman’s Self. Out of all of Hayashi’s manga currently available in English, Red Red Rock and Other Stories is probably one of the least immediately accessible. While Hayashi’s imagery can be stunning and appreciated by all, some of the short manga in Red Red Rock and Other Stories will likely be nearly impenetrable for a casual reader. But that’s where Holmberg’s informative essay comes in handy, explaining some of the references and historical context needed to fully understand the collection. I enjoyed the manga in Red Red Rock and Other Stories, but I also appreciated being able to learn more about them. The Seven Deadly Sins, Volumes 12-14 by Nakaba Suzuki. It’s been a while since I’ve read any of The Seven Deadly Sins, but I picked up the series again just in time for a major showdown. Granted, just about any of the fights that occur in The Seven Deadly Sins become epic battles simply because all of the combatants involved are so incredibly powerful. The action sequences are impressive, although sometimes it can be difficult to tell exactly what is going on. Some of the characters move so quickly only the results of their martial techniques are apparent. Occasionally Suzuki absolutely nails these sequences and they can be thrillingly effective, but just as often the action ends up being confusing. Suzuki also seems reluctant to actually kill anyone off which means the stakes don’t seem as high they should be. Well, except for the potential end of the world. At first it seems as though an apocalypse has been averted in these few volumes, but soon it become apparent it that it may have only been delayed. The Seven Deadly Sins still have plenty of fighting left to do, not only for the future of their world but also to overcome their past mistakes. Legend of the Galactic Heroes, Volume 1: Dawn by Yoshiki Tanaka. Thanks to Viz Media’s speculative fiction imprint Haikasoru, Tanaka’s award-winning Legend of the Galactic Heroes novels are finally getting an official English-language release. Although Dawn is largely a standalone novel, it feels even more like an extended prologue to the ten-volume work as a whole, providing an introduction to the setting and the war that is the focus of the series. Much of Dawn is devoted to two opposing factions, the Galactic Empire and the Free Planets Alliance, but there’s also the Phezzan Dominion, a third faction which ultimately isn’t as neutral as it first appears. While the cast of characters in Legend of the Galactic Heroes is fairly large, at this point the most is known about two rival strategists—the reluctant hero Yang Wen-li and the ambitious genius Reinhard von Lohengramm—and their closest cohorts. With strategists as some of the main characters, a fair amount of legitimate battle strategy is included in Dawn which I particularly liked. 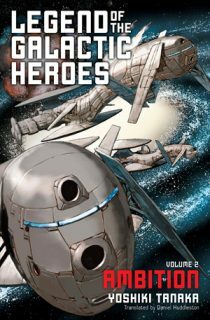 There’s also a significant amount of politics involved in the story and none of the factions come out of the first volume looking very good with their warmongering ways.